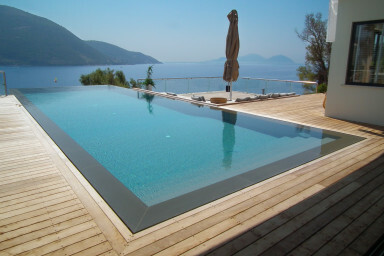 Villa Doukato- exclusive on Vassiliki bay with private dock, infinity pool. Very spacious villa with 5 bedrooms, big olive tree in the living, modern design, amazing sea view, private acces to the sea, just a dream. Just beautiful and we all loved the atmosphere from 10 years old to 55. We stayed at the Villa Doukato for two weeks, with our three daughters, husbands and grandchildren to celebrate our Golden Wedding Anniversary. It was the perfect villa in the perfect location, there was plenty to see and plenty to do. We were extremely well looked after by Morino who was very prompt in dealing with any questions. There was a great choice of restaurants within walking distance of the villa, and Vassiliki is a very attractive and friendly little town. Trés bien situé face à au petit port de Vasiliki et totalement isolé sur une colline vierge de toute construction. Trés belle piscine à débordement, terrasse extérieure en bois et puissante climatisation. Une villa de rêve mais dont il faut profiter très vite car le climat et le manque d'entretien risque de faire que les choses se dégradent rapidement. What a lucky choice for us! Villa Doukato is architecturally perfect- retracting windows, views of the harbor, beautiful furniture. So many lovely places inside and out to sit and read and to enjoy the sea, the mountains, and the breezes. The pool is practically inside the house. The kitchen is full of nice dishes and varied glasses, unlike so many rental houses. Vassiliki is a small town but just enough restaurants, stores, and water sports to keep us happy for 11 days. Most nights we walked down our private road and into town for dinner at a small taverna right on the water. Heaven. Villa Doukato was more beautiful than we expected. A perfect Greek vacation. We enjoyed a fabulous two weeks staying in Vassiliki, Lefkada in July 2017. The house was extremely comfortable and afforded fantastic views of the bay and surrounding islands. We spent many an enjoyable afternoon watching the windsurfers gliding over the waters from the houses pontoon on the beach below. Thank you. What a fantastic house viewing the windsurfers every day in the bay of Vassiliki! What a great holiday! Love Vassiliki, Love Villa Doukato! What a holiday! Never before we stayed in such a magnificent house. Close by the beach and nice village with its restaurants. Thanks! Staying in this wonderful, well designed and beautiful located villa, was amazing! The house was more than we expected. Very spacious, fantastic pool and jacuzzi, quite, clean, lovely caretakers and great windsurfing!! We will come back to Vassiliki! Bellissima villa dotata di tutti i confort! Straordinaria Veduta sulla baia , posizione tranquilla e riservata. Consiglio installazione TV satellitare in caso di brutto tempo! We had the perfect week at Villa Doukato. It was everything we expected and more. Beautifully designed, well equipped and with the most amazing view, it was the perfect venue for a relaxing family holiday. We loved the pontoon and used it daily for a sea swim. Thank you to Anna at Villas Thalassa for all her help and advice as we prepared for our trip. Great place. Wonderful house. Everybody enjoy the stay : parents ans kids. Beautiful view, stylish designed rooms. Had a fabulous stay and will return. Thanks!! !